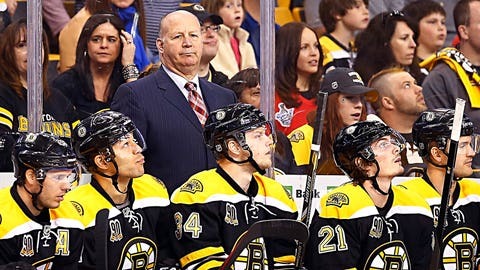 Bruins coach Claude Julien is still in the hot seat this season. The pressure is on Claude Julien this season, and it is not just because Julien could have lost his job after the Bruins missed out on the playoffs last season. The Bruins made a myriad of roster moves over the summer, but there is no clear indication that any of those moves drastically improved the talent level of the team. There is no room for error in a Boston environment where winning has become a way of life for all of the city's sports teams, and for that reason, ESPN insider Barry Melrose told WEEI radio's Dennis & Callahan show that Julien is in for a tough year. The Bruins were quick to fire former general manager Peter Chiarelli after the end of last season, but they waited for over two weeks after naming Don Sweeney as the new general manager to announce that Julien would return as coach. The failures of last season and the long wait to determine Julien's fate did nothing to dissipate rumblings about his potentially short future in Boston. It seems only winning will take care of those questions, but winning is a serious concern with early injuries to both Zdeno Chara and Dennis Seidenberg and a roster full of question marks. This season will be Julien's ninth with the Bruins, and he is currently the longest tenured coach with his team in the NHL. He is just 36 wins shy of tying Art Ross for the club's all-time coaching wins mark (387 games).